Rebecca Minkoff's "connected store" concept blends its website with real-world shopping. With permanent locations in three cities -- New York, Los Angeles and San Francisco -- these stores are all about smart mirrors. 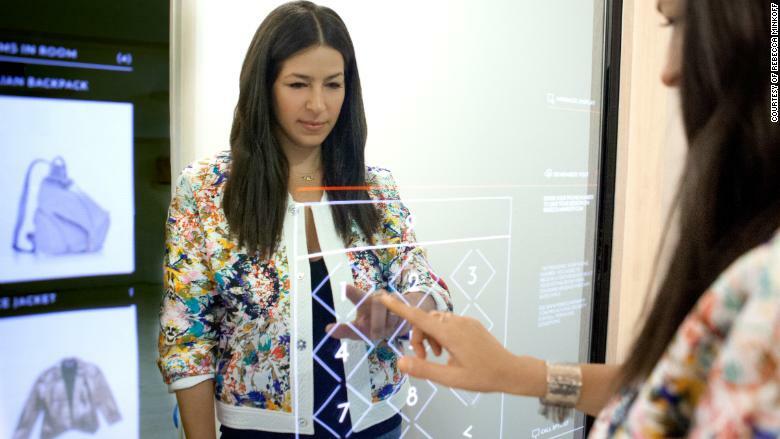 The mirrors double as touchscreens, allowing shoppers to browse looks, colors and sizes. The items you select are sent to an interactive fitting room with custom lighting options. Meanwhile, the fitting room's mirrors have a twist, too: They automatically recognize clothing via RFID technology, so they know what you're trying on. They'll also serve up what other sizes and colors are available in the store, and let you request those by tapping on the screen. In the past, Bloomingdale's featured 3D body scanners in a handful of stores to help customers find the right pair of jeans. Nordstrom (JWN) has also tested smart mirrors in fitting rooms.